100% Natural & Organic ingredients, help protect the skin underneath your beard. Revitalize and strengthen your beard, Keep your beard conditioned and shiny. Soften and hydrate your beard with no greasy residue. Stand out in the crowd and take care of your beard in Barber s Club way! The beard oils brought by Barber s Club are made from natural ingredients and are 100% organic. The natural highest quality ingredients help protect the skin underneath your beard, enable less itchiness & irritation and remove dryness & brittleness. Designed to be lightweight, these oils keep your beard conditioned and shiny. Not only this, these naturally done oils help to soften and hydrate your beard with no greasy residue while minimizing dandruff. Providing the bearded men a perfect groomed beard look and healthy front mane, these oils revitalize and strengthen your beard. Every oil from the repertoire available at Barber s Club is made in India and is scientifically proven to help protect the hair and skin of men. The oils are available in tea tree oil, lavender and rosemary fragrances. All the oils are infused with 5 natural ingredients 1. Sweet Almond Oil Almond Oil is known for its health benefits and as a beauty aid. This oil will give you smooth, flawless skin, shiny hair and controls hair loss. 2. Jojoba Oil Comes with antibacterial properties, Jojoba oil help control bacterial growth in the hair follicle. 3. 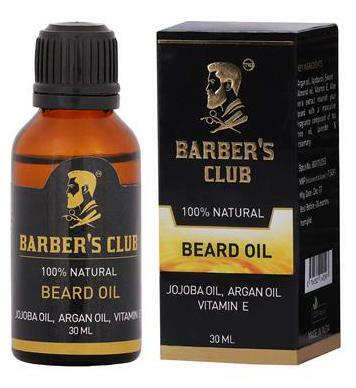 Argan Oil To hydrate and soften skin, Barber s Club has included Argan Oil for better grooming of your skin and hair. 4. Vitamin E Applying Vitamin E oil to you scalp will reduce inflammation, hence encouraging hair growth. 5. Aloe Vera Extract Aloe Vera Oil repairs dead skin cells on the scalp. It acts as a great conditioner, hence giving you smooth and shiny hair.